Upon our arrival in Hsinchu in pouring rain, Cheng-jie greeted us with a shining smile at the doorway of GEEL, ITRI, making us forget about the bad weather outside. With a PhD degree from the Department of Materials Science and Engineering, National Taiwan University, Cheng-jie was active in international exchanges, not just attending many seminars overseas but also undertaking a one-year research placement with the Material Science Department in the California Institute of Technology during his PhD studies. After graduation in 2014, he was sponsored by the Ministry of Science and Technology in taking up a post-doctoral research fellowship in the Department of Materials Science & Engineering, Northwestern University. The two years of overseas studies and training there laid a firm foundation for his current professional career at ITRI. A recent overseas recruitment organized by the Ministry of Economic Affairs in Chicago was instrumental to his return to Taiwan. While working in the US, Cheng-jie was contacted via LinkedIn, and subsequently interviewed via Skype, by the human resources department of ITRI. This eventually led to his return to Taiwan to work at ITRI. Cheng-jie recalled that during his stay in the US, he attended several overseas recruitment events organized by Taiwanese government agencies, one of which was the 2015 Hi-Recruit roadshow in Chicago organized by the Ministry of Economic Affairs. These events demonstrated the government’s strong intention and concerted action in recruiting overseas talent to return and work in Taiwan. In addition, these events provided a platform for Taiwanese companies to directly recruit overseas talent through one-to-one meetings and interviews. Cheng-jie mentioned that Taiwanese students in the US tend to be unwilling to return to Taiwan for work, which he attributed in part to a lack of relevant information. Though most Taiwanese students in the US still wish to stay and work there, they may become more willing to try a career in Taiwan if more appropriate information and contacts are offered by the Taiwanese side. Nowadays, popular social media such as LinkedIn and Facebook are major channels for overseas Taiwanese students to obtain recruitment information posted by Taiwanese companies. Cheng-jie was initially well-trained to pursue an academic research career which differs from that of the industry- and application-oriented research at ITRI. The MOEA’s overseas recruitment event sparked the idea to change his career track. Finally, after thorough consideration and consultation with his supervisor, he decided to join ITRI. For one thing, staying in the cozy environment in the US tended to leave him working in a supportive role. For another, ITRI offered him a promising career involving collaboration with industry in the search for solutions addressing the need for energy saving. His work at ITRI currently focuses primarily on systems for “electricity generation from waste heat” and “thermoelectric power generation technology”, which collects waste heat generated by a factory during production and recycles it for electricity generation so as to reduce the factory’s carbon footprint and increase its energy efficiency. The technology developed by his team at IRTI is already being applied by about ten companies in several traditional sectors, such as the steel, cement and textile industries. More applications might be possible were it not for the high cost associated with deployment of the system. 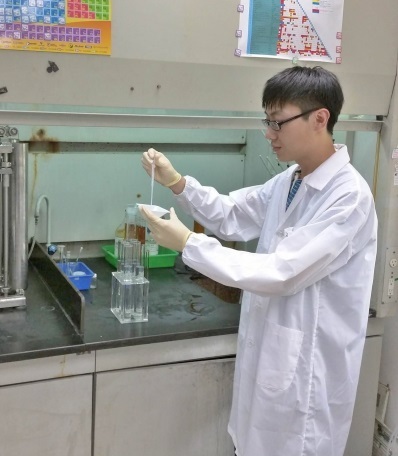 With his solid background in material science, Cheng-jie is helping his team to explore alternative materials that are more cost-efficient while maintaining the same production efficiency, so as to enhance the market competitiveness of their solutions. In the future, Cheng-jie may be required to take on the role of bridging overseas research networks and his lab at ITRI. While new to ITRI, Cheng-jie has already come to understand GEEL’s competitive advantage and commitment to the cultivation of talent. In the field of thermoelectric power generation technology, GEEL has achieved a well-respected performance in system development and has produced many academic publications that have been well-received by international academic bodies. GEEL is well budgeted and equipped with facilities that include all necessary resources from upstream production to downstream system integration, so researchers there can feel comfortable in committing themselves to R&D work. In addition, junior researchers are well trained by their senior members, via factory visits and lab work, in applying basic science to industry. ITRI also provides its researchers with abundant training resources, such as new recruit training, an internal learning platform (https://lrndb.itri.org.tw/index.aspx), patent-related courses, and business start-up courses, which are particularly useful in helping fresh researchers settle in and prepare themselves for application-oriented research projects. Utilizing these resources, Cheng-jie has developed into an independent researcher within his short period of time at ITRI. Finally, Cheng-jie stressed that it was because of the efforts of ITRI’s overseas human resources department, facilitated by the government’s overseas recruitment events, that he was able to land a job within his desired career path. Returning to work in Taiwan has allowed him to move from the ivory tower of academia to technology research for industrial applications, broadening his horizons and enabling him to better serve society. He is grateful for his return to his homeland and the opportunity to contribute to Taiwan’s industrial innovation, which he feels is more rewarding than staying in academia overseas. He hopes to see more overseas talent join ITRI, like he has done, in the pursuit of a more fulfilling career.